Rounding out my quartet of goblin types are imps. Imps are the most prolific of goblinkind. Ironic, then, that I have yet to use them in any of my novels or shorts. In many ways they are the canon fodder of any goblin army. But they're not sheep. They may not be as cunning as haureks and certainly not as strong as gaugaths, they nevertheless have their strengths. Read on to learn about these qualities and more. The most prolific of goblins are imps. Neither the smartest nor the brawniest, their greatest strength is their sheer numbers which they use against their enemies to harry, frustrate, and finally overwhelm them. They delight in setting traps and ambushes and have gained general notoriety as wicked creatures who delight in the spread of chaos and misery. Unlike other goblins, imps abhor sunlight. Even the light from the moon and stars annoys them to the point where they will venture out from the Underland only when the prize is grand or the whip at their backs too painful. And if the whip fails to properly motivate them, they are easily bribed by healthy quantities of haurek ale. Imps are excellent miners and hard workers when presented with the right incentive. Just like their larger brethren, they are extremely superstitious, and look upon events which seem out of the ordinary to be signs of things to come. Their own shamans and witch doctors, who practice their own form of crude, goblinish sorcery, are held in the highest regard. Imps take slaves as needed, especially when they are in need of someone well-versed in some particular skill. It is rare, but not uncommon, for them to come up from their underground lairs on moonless nights of their own free will in order to raid towns and villages in search of slaves, plunder, and food. When a particular slave is no longer needed, imps prepare an extravagant feast with the slave as the main course. Dwarf-like in stature, imps have none of a dwarf's thickness. Instead their limbs are bone thin, their necks are scrawny, and they have only the leanest of musculature. Impen eyes are white without pupils and provide them little in the way of eyesight. Instead their hearing has grown super-sensitive, compensating for their other sense's shortcomings. They typically do not wear heavy suits of armor, preferring the greater mobility advantages of loose garments or nothing at all. In battle and on raids, they wield small swords, axes, and blow guns from which they shoot poisoned darts. "Leave her, Speck!" the witch screamed from the other side of the dais. "She is not for eating!" Speck slowed, and then stopped. His teeth remained bared at Holly and she couldn't help but see the venom in his eyes. "Once my mistress is done with you," it said to her, "you shall be a tasty morsel indeed." Speck took a moment so spit in Holly's direction before joining the witch. When Speck stood at her feet, he said, "I bring that which you have asked for, O Mighty Harbinger of Death, O Patroller Slayer, O Ruler of the Simarron, O—"
"Just give it to me, you insipid little creature!" the witch hissed. Speck jumped back in surprise. It took him a moment to regain his composure. When he did, he held out a hand to her and something unseen passed between them. "You have done well, my slave. Now, return to my house and there await my return." Speck bowed, shooting one last look at Holly—a look that promised retribution—before he left the chamber. The witch returned to her task and Holly wondered if she might fall asleep again when the witch spoke. "Speck is an annoying little creature, but he serves me well." 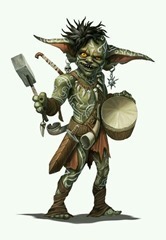 Grekkels are the smallest and most devious of the goblin races. They rely upon guile, stealth, their peculiar magical abilities, and general slyness to annoy, distract, and ultimately overcome adversaries. It is their evil dispositions coupled with their joy of creating mischief and chaos which causes people to both fear and loathe them. They are loners by nature, though they will sometimes band together with their own kind should an opportunity warrant such a union. These sorts of gatherings are always short-lived and, more often than not, end in the grekkels fighting amongst themselves as their greed and unruliness often takes precedence over all else. Grekkels may also be found serving some goblin lord, witch, or dark sorcerer, willingly accepting this role as spy and information gatherer as long as they share in the mischief. They are not fearful of magic just because it is magic, nor are they superstitious. Their humor is crude and sick, often climaxing with the death of some helpless creature. Their laughter is prolonged and hideous. Grekkels make their lairs in the Underland or some other dark place. They abhor sunlight and will make forays onto the surface world only at night. Even then, a full moon or an abundance of bright stars will send them scurrying for shelter. They are sexless beings and do not therefore reproduce in the traditional manner. In asexual fashion, they require only a single member of their race to produce offspring. Young reach maturity in about a week's time. They are omnivores, though they prefer meat of any kind above fruits or vegetables. They will not hesitate to eat carrion, their own kind, or any other humanoid. Though they've no use for money or jewelry, they sometimes collect shiny baubles or trinkets as they seem to be fascinated with such things. They do not make use of armor to cover their hairy bodies, though they will use short spears or blow guns, as well as their teeth and claws, to attack the unwary. Their preferred method of assault is always from ambush, after having harassed and annoyed their prey with any number of traps, snares, and surprise hit-and-run attacks. They stand about two feet tall and are slender to the point of being cadaverous. Their noses are long and hooked, their tails, hairless and spindly, and their arms and legs, gangly. They have only three fingers and an opposable thumb on their hands, with three toes per foot. Grekkel ears are long, flat and perk upwards. Their yellow eyes are slanted with dark, beady pupils. Their chins are long and can be curled when the grekkel so desires it. Tongues are long and skinny. Their lips are black. There exists a strain of grekkel that possess wings, or so it is said. Grekkels are inherently magical. Their mere presence can have adverse effects: milk will sour, fruit will fall from trees, luck will be spoiled. They can weave nightmares by whispering dread things in the ears of sleepers, and can commune with flies, mosquitoes, spiders, and scorpions. They have the ability to teleport up to a distance as far as they can see. The use of this ability leaves behind the smell of brimstone. They are highly resistant to most forms of magic. Grekkels are a truly fun species to write about. More nuisance than anything else, they nevertheless have enough deadly potential to really make things interesting at times. My grekkels are the closest thing I have to the goblins of mythology. At best, they are the small creatures that come out at night when on one is awake and empty the contents of the cupboard, spoil the milk, or steal the blankets from the wee ones on a cold night. Worst case, they slit the throats of everyone inside and make off with their steaming entrails. They're truly wicked creatures. From an author's perspective, they're about as expendable as mosquitos. No one's going to get upset when you whack one of them. In The Hall of the Wood, I whacked quite a few of them. But what I like about grekkels is that they aren't necessarily hell-bent on killing the protagonists or obeying orders. Their knack for easily being distracted often leads them down a path that might not align with their master's (or even their own) agenda. It's this unpredictability that makes them more than just canon fodder and at least somewhat interesting. An excerpt from The Hall of the Wood, wherein we find the gaugath warrior and brewmaster, Nohr, on his way home from a job not done well. Nohr walked east through the Simarron, back towards his tribe, his family, and his beer-making. He had done what the witch had wanted of him. Not successfully, but he had tried, and now considered himself free of his commitment to her. If the witch saw things differently, then let her journey to Desolation Peak and challenge him there. Nohr chuckled at the thought, for only fools came to a gaugath village looking for trouble. Nohr had agreed to accompany Skave into the woods only because Lord Gral had so commanded it. Soon the Meat Peddler would rule the Simarron. He would have no time or care for what Nohr had or had not done for the witch. Nohr spat, cursing the witch and her buggery beneath his breath. Let the Peddler deal with her, for Nohr planned to never lay eyes on her again. After their confrontation with the heroes, Nohr had run far enough away that pursuit was unlikely and hid. Then, when he deemed it safe, he returned to the ambush site to gather up Skave's body. He left the stalker's weapons behind, for they were too small for Nohr's own use and not worth much in trade. Gaugaths, even young ones, did not fight with swords and knives, preferring hammer, mace, or morning star. But the haurek's body, even unseasoned, would make a tasty meal on the road home. Nohr had already bitten off one of Skave's hands. The bones were crunchy, but the skin tough, and Nohr had longed for his beer to wash it down. Nohr thought with anger of the knight, who had spilled the last of his prized mead. It had been a fine brew, and well worth the effort of lugging it down from the mountains and through the forest. Curse the knight for wasting the last of it, and curse the witch for bringing him here! "By Chaeick's balls," Nohr grumbled, "I'll have Desolation Peak in sight by week's end or I'm a—"
The witch stepped from the brush, barring Nohr's way and stopping him dead in his tracks. Swallowing hard, Nohr tried to say something, but instead choked on the bile rising up from his throat. The witch, who came only to the gaugath's shoulder, studied him for a moment, then looked to the body he dragged behind him. "What has happened?" she asked, hissing. "Lie to me, and I shall know it!" As the largest, strongest, and most ferocious of goblins, gaugaths could lead all others of their kind if they so chose. But gaugaths, for all their warrior spirit and battle prowess, prefer nothing more than to dwell in their mountains, cultivate their lands, and brew their seasonal beers. Of all goblin-kind, they alone do not occupy any part of the Underland, referring the highest of elevations where they can feel the coolness of the mountain breezes on their faces and, more importantly, where few will ever bother them. Gaugaths are extremely territorial. They dwell in tribal units where the strongest of the males serves as chieftain. They are possessed of incredible strength, are savage warriors whose own stamina and bloodlust easily exceed that of the greatest of Anolgan berserk warriors, and are known far and wide as perhaps the most tenacious of opponents. They are omnivores, feeding upon everything from berries, roots, and plant bulbs to ground dwelling rodents, moose, elk, mountain goats, and mountain sheep. They often raise the latter. A particular favorite nut of theirs are whitebark pine nuts, which they will horde when in season. With their excellent sense of smell, gaugaths can locate carrion from miles away. They have no reservations concerning eating such fare. They are not even averse to eating humanoids, though they find them inadequate morsels for the most part. They do not cook their food; their teeth and digestive systems are well suited to eating tough roots or raw meat alike. The gaugath mating seasons runs from late spring to early summer. Males can become quite erratic during this time as they vie with each other over the rights to mate with the most select females. Birth occurs in early spring following a gestation period which coincides with the gaugath hibernation cycle. Gaugath warriors do not use missile weapons in combat as they prefer to close with their opponents where their great brawn always gives them the advantage. They can be tactful and sly, setting traps or lying in wait in ambush when such tactics are necessary. Their weapons are large as suits their bulk. Amongst their favorites are massive iron hammers, clubs, morning stars, and flails. An unarmed gaugath is equally deadly, for they can strike with their thick claws, dealing considerable damage to unprotected flesh or simply stunning or bashing an opponent from shear force of the blow. Armor will be varied and mostly mismatched, though the greatest of the tribe may have a full suit akin to plate mail. Their fur, thick as it is, provides fair protection on its own. Gaugaths enjoy a good hunt as much as a good brew. Their beer—a particularly thick stout—is unpalatable to most. Even dwarves find Gaugath stout repugnant. A bugbear is a legendary creature or type of hobgoblin comparable to the bogeyman, bogeyman Budy, bugaboo, and other creatures of folklore, all of which were historically used in some cultures to frighten disobedient children. A bugbear is depicted as a massive humanoid distantly related to goblins and hobgoblins. Named for the bugbear of legend, the bugbears of Dungeons & Dragons are goblinoid creatures, larger and stronger than hobgoblins. For those who played 'back in the day', who isn't familiar with this picture? While classic, that particular image is a bit dated. You can head over to my goblin gallery on Pinterest to see some more modern takes on the bugbear. 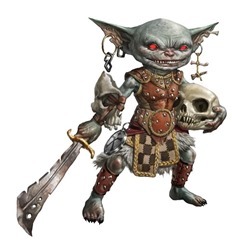 Bugbears were already distantly related to goblins, but they were considered a separate race. I decided to make them a bona fide member of the goblin race. It should come as no surprise that they are a blend of goblin and bear (how this union came to be is probably best left unexplained). Bugbears therefore share many traits with those two species. This made their creation kind of interesting because I wound up doing a little research on the behavior, eating habits, and social structure of real-life bears and incorporated those findings into my take on this species. Their omnivorous diet came from this as well as their need to hibernate and even their mating cycle. Generally, bugbears are a fairly sparse race. However, of the four mountain ranges of Uhl (map can be viewed here), they can be found in three of them. Namely, travelers might encounter them in the Ugulls, Alzions, or Alderdens. The Anolgan Peaks is the one place you won't find them as those mountains have been scoured clean by the dwarves of Rillock and Anolgan barbarians. 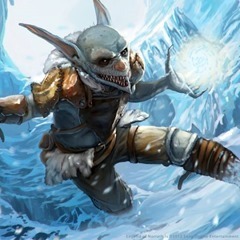 Goblins are the most prolific race found in Uhl. Most dwell in the subterranean darkness of the Underland or at the highest of mountain peaks. Collectively, there are four species: gaugaths, haureks, imps, and, the smallest, grekkels. This is not a hierarchy, per se, as each prefers to exist alongside their own particular kind. But in a society ruled by brawn, gaugaths, the largest of goblin-kind, are often at the top, though haureks, with their greater cunning and intelligence, are just as often found in positions of leadership. Imps and grekkels are both the regular soldiers and spies of goblin-kind. While there are some similarities amongst the four sub-species—they are all beer drinkers, for example—there are far more differences. Left to their own devices, they've each their own leaders, social hierarchies, taboos, rituals, and festivals. They come together beyond that only when opportunity for gain—such as a nighttime raid to the surface—presents itself. The Underland's true vastness is unknown to any surface-dweller. It is therefore also unknown how many goblin fortifications, cities, and other settlements exist. Those that are known, namely Greth and Gugal, have been identified only because of their persistent attacks on the Four Fiefdoms and raids into the Freelands. Members of the King's Patrol watch these remote mountain fortresses closely from the frontiers of civilization. But because of the Underland's expansiveness, it is not unknown to have a goblin raiding party emerge right in the middle of a populated area. Their threat remains a constant one. It doesn't seem like you see a lot of non-humans in fantasy anymore. Certainly orcs and goblins are few and far between. I can understand orcs given their use in Lord of the Rings. In that light, orcs almost become like elves, overused and with little if anything new brought to the table. Goblins, in my mind, are a bit different. Much more steeped in mythology, they are often portrayed as connivers and tricksters, spoiling food, knocking over milk, and generally being all-around nuisances. My grekkels fit that bill. Their presence actually spoils milk. They have an annoying tendency to cause bad luck. They're cowards at heart but can be pretty nasty when aligned with the right (or wrong) people. Imps are your basic Dungeons and Dragons sort of goblin. Somewhere between gnomes and dwarves in size, their tactic in battle is to use their sheer numbers to overpower their enemies. Haureks are very human-like: smart, cunning, and experts in many different areas. Gaugaths are the giants of goblin-kind. You don't want to mess with them. Goblins—specifically grekkels, haureks, and gaugaths—made their first appearances in The Hall of the Wood. I've not revisited them since, but they are still there, dwelling deep underground and waiting for their next opportunity to come to the surface and cause general mayhem. They may find their way into The Alchemancer series, in fact. That's a strong possibility for book 3.